Updated: When Will Solid State Lighting Vanquish the Light Bulb? Friday was the 132nd birthday of the light bulb—the technology’s last birthday before phase-out. Updated: Last week was the 132nd birthday of the light bulb. 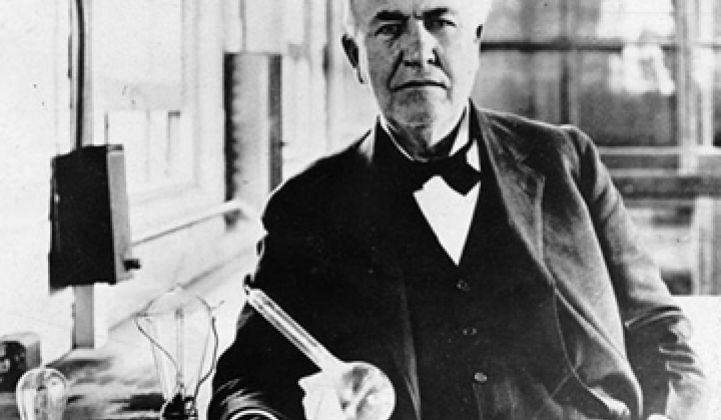 On October 21,1879, Thomas Edison devised a workable electric light at his laboratory in Menlo Park, N.J. It will be the last birthday that the incandescent bulb will have has before the national phase-out and efficiency standard starts (with the 100-watt model) in the U.S. in January. Last year, Jason Matlof, a partner at Battery Ventures, claimed that 2011 could be the year of the solid state lighting crossover, when incandescents finally give way to LEDs. Matlof, like many VCs, is an optimistic sort. And while Matlof might be off on the exact year, he's probably accurate with regard to the decade. Similarly, Alan Salzman of VantagePoint Venture Partners has told Greentech Media that he sees a transformation occurring in lighting, with everything switching out to solid state lighting and causing "a $100 billion industry to flip." In Salzman's view, the mammoth lighting incumbents like Philips, GE and Osram "might catch up -- or might not." The facts are that while human flight has progressed from the Wright Brothers to space travel, our world continues to be illuminated by the incandescent bulb, Edison's bulb. And those incumbents like Philips, GE, Osram, and Sylvania are not going to let this mammoth market slide from their hands without a considerable fight. When asked what's holding back LED adoption in the lighting industry, Jed Dorsheimer, a Managing Director at Investment bank Canaccord Genuity, blamed his wife. While the soon-to-be-former-if-Jed-doesn't-apologize Mrs. Dorsheimer is not single-handedly preventing the LED lighting revolution, it's people who care about light quality that are slowing down LED adoption. The initial cost of LED lighting doesn't help the cause, either: light bulbs show tremendous price elasticity. But LED light pricing is dropping fast. Fred Maxik, the founder and CTO of the 900-employee Lighting Science Group, doesn't feel that cost is holding the industry back. He told me recently that in commercial and retail applications, LEDs can today be justified on an energy efficiency basis. What's needed, according to the CTO, is consumer education. Industry pundits, investors, and entrepreneurs have propagated the "flipping of a billion-dollar industry" meme for a while now, but that's not the way most hardware industries shift. The movement away from incandescents is occurring, but it will happen more slowly and more painfully than VCs or entrepreneurs expect it will. What's driven the market in its current phase is not general illumination but more specialized consumer products such as mobile phones and flat-screen TVs. LEDs have not yet made it into the home on a large scale. However, they have started to make it into the enterprise. Groom Energy and Greentech Media Research predict that the LED enterprise lighting market will grow by 30 percent in 2011 and surpass $1 billion in annual revenue by 2014. The 2010 U.S. market for commercial and industrial LED lighting is sized at $330 million in annual revenue. The lighting market is a complicated ecosystem with an entrenched and fragmented supply chain and sales channel. This is the power of incumbency and perhaps one of the biggest challenges facing SSL startups. Mike Dauber, a VP at Battery Ventures, has said, "The lighting value chain is very complicated and highly controlled; a startup must show incentives to everyone in the value chain." The SSL ecosystem has many moving parts; below, we list some of the prominent startup players in each of this market's many sectors. Lighting remains one of the last frontiers for energy management in office buildings. Imagine if your heater only had two modes: full-blast and off. That is what lighting is like in most buildings. Dauber highlighted Battery portfolio firm Redwood Systems. He said, "Redwood excites us because they're creating an entirely new category of lighting -- building performance lighting -- that will allow building owners to get value out of their lighting in ways that they never would have conceived of a few years ago." One retailer is looking at Redwood's ceiling networking as a way to monitor traffic in stores and at check-out counters. Office building owners are also looking at ways of exploiting the technology to make better use of their conference rooms, such as using motion sensors to determine if a conference room is currently being used. Johnson Controls, the building management behemoth, has installed Redwood’s technology at its headquarters. Other customers include SAP and real estate developer Equity Office. Redwood's core product is a centralized computer with 64 controllable channels. If a building owner puts LEDs on those channels, the centralized console becomes a tool for managing lighting in buildings. If motion and/or temperature sensors are added, it becomes a combination light network/facilities monitoring service. Adura Technologies was one of the early entrants into lighting networking. The company’s technology controls the lights illuminating more than 2.7 million square feet of commercial real estate. Adura’s technology uses ZigBee modules with individual modules attached to fluorescent or LED light fixtures; these speak to other gateways, controllers, and devices to orchestrate lighting in a building. Google is a customer. EnLighted recently won $14 million in funding from Kleiner Perkins Caufield & Byers, Draper Fisher Jurvetson, and Intel Capital for intelligent lighting and energy management in offices and large facilities. Lighting Science Group is developing a 60-watt-equivalent LED bulb with Google that is controllable from an Android phone. The idea is to allow users to control and program their bulbs remotely. The bulbs will communicate through a Wi-Fi network anchored by a home router. Lumenergi provided dimming and networking capabilities for fluorescent lights. Daintree Networks has created a ZigBee-based lighting platform called ControlScope that it wants to sell to established lighting makers. Jed Dorsheimer, the Managing Director at Canaccord, said, "The replacement of the Edison bulb with the LED bulb is a band-aid solution -- the fixture will become more important." Here is a small selection of those "band-aids." Lighting Science Group sells a 40-watt-equivalent LED bulb (pictured above) for $21 on Amazon. The firm is also developing a 60-watt-equivalent LED bulb with Google that is controllable from an Android phone. The idea is to allow users to control and program their bulbs remotely. The bulbs will communicate through a Wi-Fi network anchored by a home router. Home Depot has also started selling LSG's LED bulbs, in this case, a 770-lumen, 9-watt LED bulb that will come with a suggested retail price "in the low $30s range." Albeo Technologies has lit up a 750,000-square-foot space with LEDs, one of the largest LED installations in the U.S., according to the firm's CEO Jeff Bisberg. The firm's LED products can replace high-bay HID lamps. Their wide range of LED lighting assemblies are created specifically for industrial and commercial buildings. Lemnis builds screw-in LED bulbs that replace the incandescent household bulb. The firm's Pharox bulb puts out about the same amount of light as a 60-watt or 40-watt incandescent, but consumes just six watts of power. Lemnis founder Warner Philips is the grandson of the founder of Philips Lighting. Lemnis has shipped more than three million bulbs to date and has a pipeline of hundreds of millions of bulbs to be shipped in the coming years, according to the founder. He claims that that makes Lemnis the world's leading supplier of LED bulbs. Lattice Power is based in China and is building LED bulbs with funding from GSR Ventures, Temasek Holdings, Mayfield Fund, AsiaVest Partners, and Keytone Ventures. Switch is looking to sell a dimmable 75-watt-equivalent, 1100-lumen bulb in the $20 to $25 range later this year. The bulb uses liquid cooling (video below). Liquidleds also builds LED bulbs with liquid cooling. Illumitex builds a rectangular LED array assembly with funding from DFJ Mercury and NEA. Bridgelux, with its $180 million in VC funding, is looking to build low-cost, high-output gallium nitride LEDs grown on inexpensive silicon wafers. Optoelectronix builds a range of LED light engines across the full scope of commercial lighting applications. Luminus Devices builds white LEDs for general illumination and specialty applications. LEDnovation builds LED replacement bulbs. Intematix makes LED packaging materials, but phosphors are the core of Intematix's business. The firm develops and manufactures phosphors for high-brightness LEDs. Intematix has taken VC funding in the past (from DFJ, Crosslink and East Gate), but more recent funding has come from strategics, including Samsung and Sumitomo. ShineOn, which has raised $51.5 million in two rounds from investors Mayfield Fund and IDG-Accel Capital, specializes in packaging for lighting. Packaging in SSL involves designing and creating circuit boards, thermal management, phosphor lenses, and other components that surround the LED itself. Excess heat can reduce efficiency and the lifetime of LED lights, but startup Nuventix copes with the heat that comes from LEDs in an innovative fashion. With technology spawned from Georgia Tech, Nuventix replaces unreliable and noisy fans with a unique cooling method. The firm uses turbulent pulses of air to cool LEDs and other electronic components. The firm's CEO explained the technology in these terms: "Picture a loudspeaker with a flexible membrane instead of a paper cone. As that membrane is moved at 50 cycles per second inside an enclosure, you push air." More notes on the Nuventix technology can be found here. The startup has received more than $32.5 million in funding from Braemar Energy Ventures, Uniquest of Korea, Advanced Technology Ventures, RHO Ventures, InterWest Partners, and CenterPoint Ventures for its active thermal management technology. QD Vision, created by researchers at MIT, places quantum dots in front of LED light sources to improve the light quality. Luxim's high-intensity plasma lighting competes with high-pressure sodium or high-intensity discharge lighting. Luxim's dimmable, electrode-less bulbs are a fraction of the size of the competition and can outlast and outlight their "nemesis," according to Tony McGettigan, Luxim's CEO. Lumetric develops drivers that allow HID lighting to be more efficient.